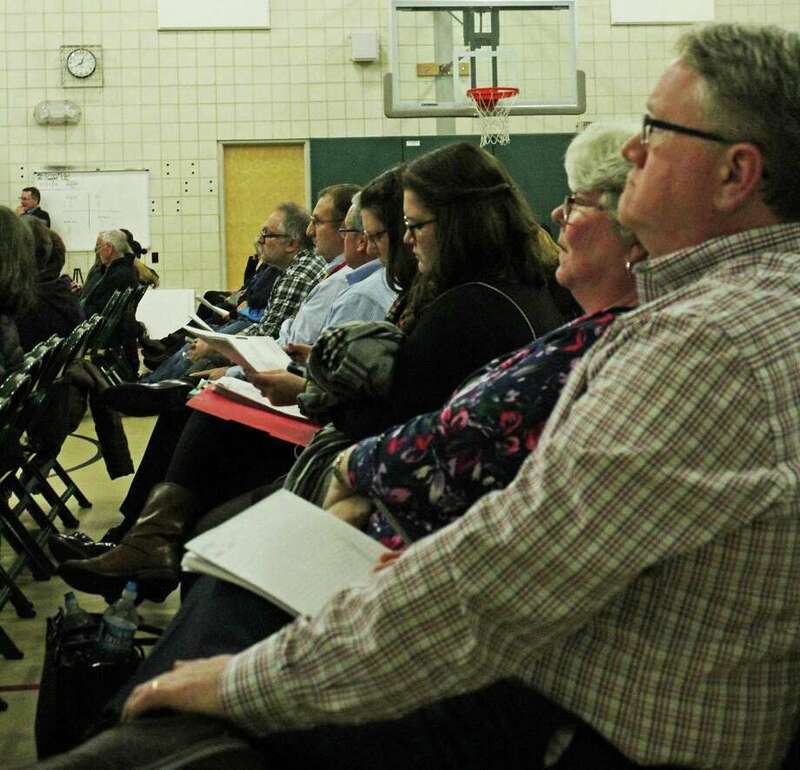 FAIRFIELD — A proposal for a 64-unit memory care facility on Stillson Road got its first public hearing before the Town Plan and Zoning Commission, and a very large contingent of neighbors, Nov. 15. The commission moved the hearing from its usual meeting space in the all purpose room at McKinley School to the gymnasium to accommodate the crowd. The hearing has been continued to the panel’s Dec. 13 meeting. For neighbors, as well as commission members, traffic was a point of contention, with some TPZ members arguing that the applicant, Massachusetts-based ND Acquisitions, LLC, didn’t take into account rush hour traffic at the busy intersection. According to traffic engineer Chris Mojica, of Stantec, they believe there will be about 13 trips to the facility around 7 a.m. each morning when the day shift starts, while he said morning peak rush hour is around 7:30 to 8:30 a.m. “It’s outside the peak area,” Mojica said. “What about the school,” Chairman Matthew Wagner asked. “This is very proximate to a school in terms of coordinating with school bus routes and shift changes.” Wagner said the applicant for Maplewood, an assisted living facility on Mill Hill Terrace, coordinated its work shifts with the start times of the nearby elementary school. Osborn Hill School is just down the road from this latest proposal. Vice Chairman Gerry Alessi suggested the traffic data did not take into consideration the impact on traffic trips in and out of the facility at the time of staff changes. And, Alessi said, peak morning traffic starts in Fairfield around 6:30 a.m. But Mojica said according to their traffic counts, traffic was lighter between 6:30 and 7:30 a.m., and overall conditions were better. “I want to know what the traffic is going to look like going in and out of this building,” Alessi said. The 60,000 square foot, two-story, facility will be built where four single-family homes now stand. Attorney Tim Hollister said its being built in an area that is a transition zone from the commercial development on Black Rock Turnpike, and the residential areas on Stillson Road. He also said the facility is not like typical assisted living facilities, like Maplewood, because it only serves people with dementia. According to the applicant’s appraisal expert, there would be no affect on nearby property values, and the design team said efforts were made to help the building harmonize with the neighborhood’s character. Doors are alarmed to keep residents from wandering, and the rear of the building is encompassed by an 8-foot high stockade fence.